Last month, The Weather Channel visited Grady College to discuss a range of exciting partnerships. The NMI and TWC (don’t you love acronyms?) will be launching a partnership dedicated to exploring new media photography, drones, user-generated content and more. As the first step in a collaboration with TWC, the NMI will be offering a new version of NMIX 4200 in Spring 2016: New Media Photography. In this class taught by John Weatherford, students will learn about and gain experience with various types of new media photography (drones, VR, smartphone live-streaming video, etc.) and discuss the issues surrounding them. 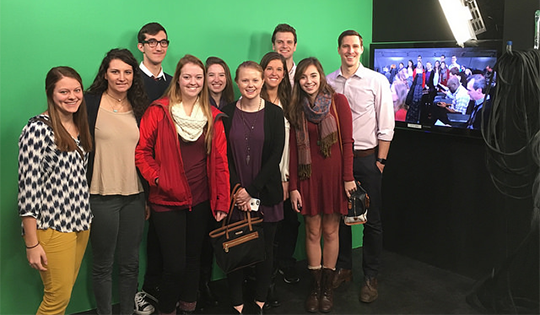 Students will also test new digital photography equipment, evaluate workflows on new TWC projects set to launch in 2016, participate in on-air TWC segments, and gain access to TWC facilities and training. We look forward to this partnership and keeping you up to date on all the cool opportunities provided to our students!